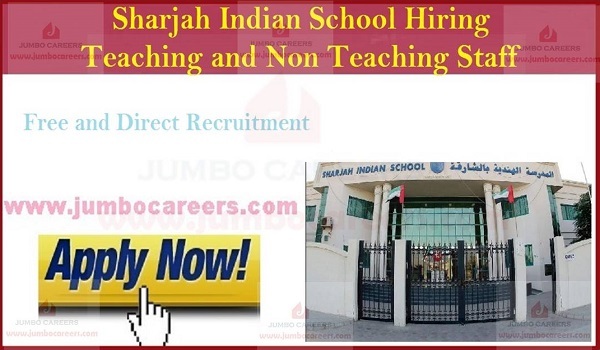 Indian Community school run by Sharjah Indian Association, Sharjah Indian School Free recruitment 2019. Sharjah Indian School urgently hiring teaching and non teaching staff in March 2019 for Al IBTISMA Center- Sharjah. Its free and direct recruitment by the company. * Helper preferably HSC/+2 with at least 2 years experience in an environment of special need education or worked as a shadow teacher to assist children. * Special Educator preferably Masters in Psychology/Social Work/B.Ed in Special Education along with 5 years of minimum experience in the same field. * Assistant Teacher preferably Bachelor’s Degree and Diploma in Special Education along with 2 years of minimum experience in special school environment. * Physiotherapist preferably Masters in Physiotherapy/Bachelors in Physiotherapy with qualification in NDT and having great number of experience in a similar role.